This window provides all the desired options to perform find and replace operations. You can define the text to be found, the find scope (current document, all solution, all tabbed documents, etc.) Also, this tool allows you to use regular expressions in the find field. This makes this tool very powerful and flexible. Also, you can generate a list of all search “matches” into a separated window, so you can navigate through them later. 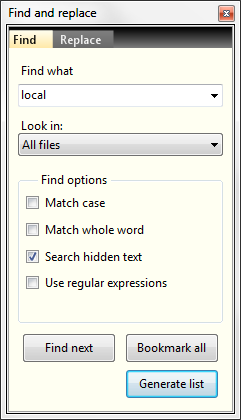 When you do this, a Search list window will be shown in the IDE.